With the rise of Democratic Socialists like Alexandria Ocasio-Cortez in Brooklyn, NY, friends of freedom and prosperity will have to learn how to understand, identify and successfully counter a new generation of intellectually uninformed and economically reckless socialist ideas. This is unmitigated egalitarianism, or socialism, a term that its proponents only use with "democratic" as a prefix. That, however, does not change the fact that - as we can see with abundance in Venezuela - socialism in every one of its forms sooner or later leads to tyranny, starvation, deprivation and collapse of society as a whole. In learning what delusions "democratic" socialism rests on, a good place to start is to learn about Marxist economic theory and the conflict theory that constitutes its core. One of its central tenets is that corporate leaders are only focused on profits. In a tradition tracing all the way back to Karl Marx, socialist economic theory suggests that the "bigger" capitalism gets (whatever that means) the more capitalists gobble up the total value of production in the form of profits. Workers, by consequence, are left with less and less in the form of wages: the bigger profits get, the less is left for the workers to earn in the form of wages and salaries. b) Steady decline in the wage share of the sum total of wages and profits. The last point is essential to Marxist theory: it relies on the premise that employee compensation and profits are mutually exclusive. This premise, in turn, relies on an implicit axiom (i.e., an assumption that is necessary for the premise but is not mentioned in the analysis) saying that profits and wages are earned in the same jurisdiction. In plain English: a business cannot reap profits from abroad and bring them back to America. If they do, the conflict between wages and profits is weakened even if we accept the premise of the conflict itself. A true-to-the-core Marxist would answer that it does not matter where the profit is being shipped off to; the mutual exclusivity between wages and profits still stands. This is true under some specific conditions which we are not going to waste time on here; what matters is that the more global corporate activity is, the less relevant Marxist conflict theory becomes from a practical, policy viewpoint. 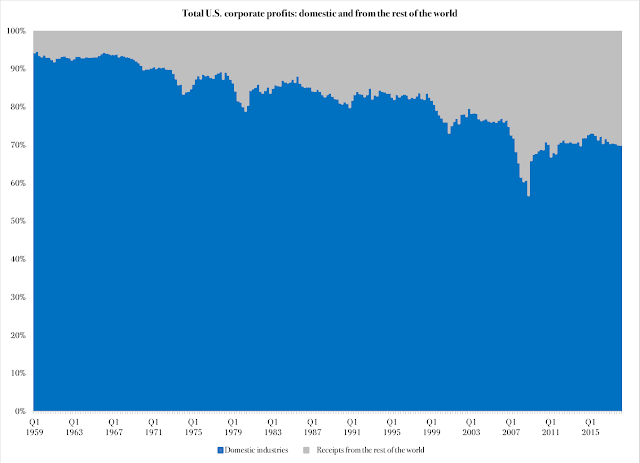 If three out of ten profit dollars earned by U.S. corporations are sourced from abroad, there is no conflict between that profit and American worker earnings. On the contrary, if we follow Marxist conflict theory to its core it should be better for the American working class if American capitalists earned all their money abroad, because that way they would not be stealing money from American workers. How, exactly, U.S. workers would earn a living if all corporate profit came from abroad, is a question that American Marxists have yet to answer. There is another complicating factor in the Marxist narrative. Its conflict theory is based on the mechanics of manufacturing: a worker arrives at the factory in the morning, spends the next ten hours or so putting widgets together, and gets paid for his work at the end of the day (or week). His pay is part of the so-called surplus value produced during each workday; the definition of "surplus value" is artificial in nature, as Marx had no business experience or otherwise common-sense gathered insights into the corporate world. Be that as it may: according to Marxist theory the worker owns all of the surplus value because it was his work that produced that value in the first place. Therefore, when the capitalist only pays him a percentage of the surplus value - the profit - the capitalist "steals" from the worker. Foreign-sourced profits and profits from non-manufacturing industries (the financial industry being just one example) present strong enough challenges to Marxist theory, but there is more. At the core, Marxism relies on the mutual exclusivity of profits and wages - to the point where a rise in the former must correlate with a decline in the latter, and vice versa. 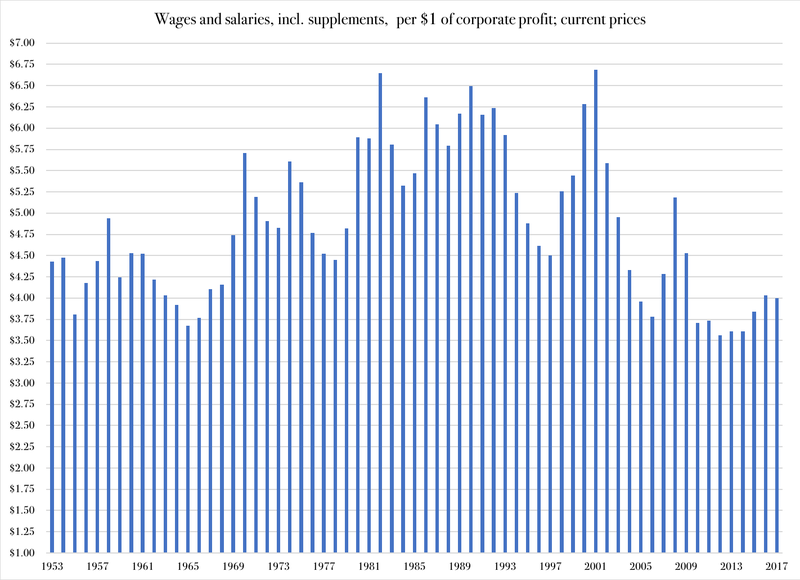 During the 1960s corporate profits grew strongly, as did wages. During the more volatile 1970s and 1980s, wages kept growing even as profits did not, although the growth rate in wages declined when profits were weak or negative. Then, as profits solidified during the 1990s, wages saw stable growth again. The 2000s and 2010s have exhibited weaker correlation, though by no means the kind of negative correlation that would be required to validate Marxist conflict theory. The plain answer is: no. 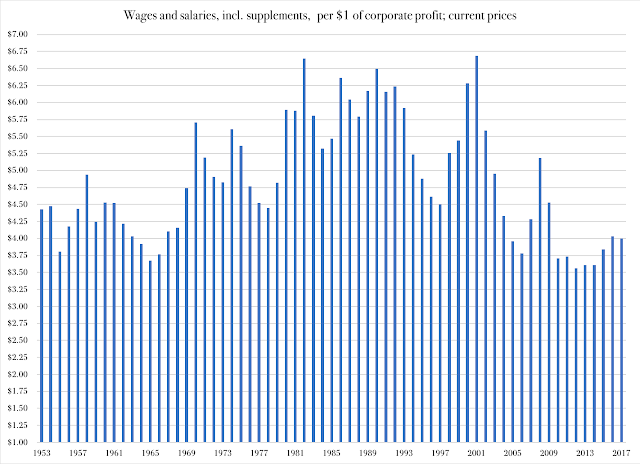 During most periods of strong profit growth - 1970s, early '80s and the 1990s - the wage-per-profit-dollar ratio is comparatively high. This suggests that worker earnings actually correlate positively with corporate profits. This comes as no surprise to anyone who knows how a free-market economy works, and how the value is produced out of which both profits and wages are paid. That said, a Marxist could point to the past 15 years, approximately, with a lower wage-to-profit ratio. 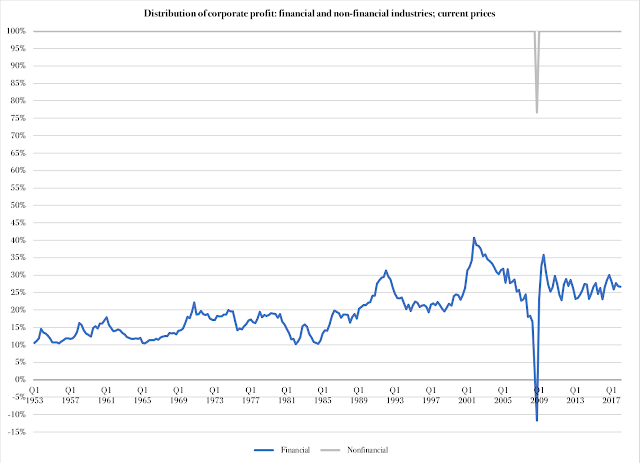 This, he could suggest, shows that profit growth has happened at the expense of wages. There are two problems with this argument. First, as explained in Figure 3, profit growth in the 2010s has been relatively weak. 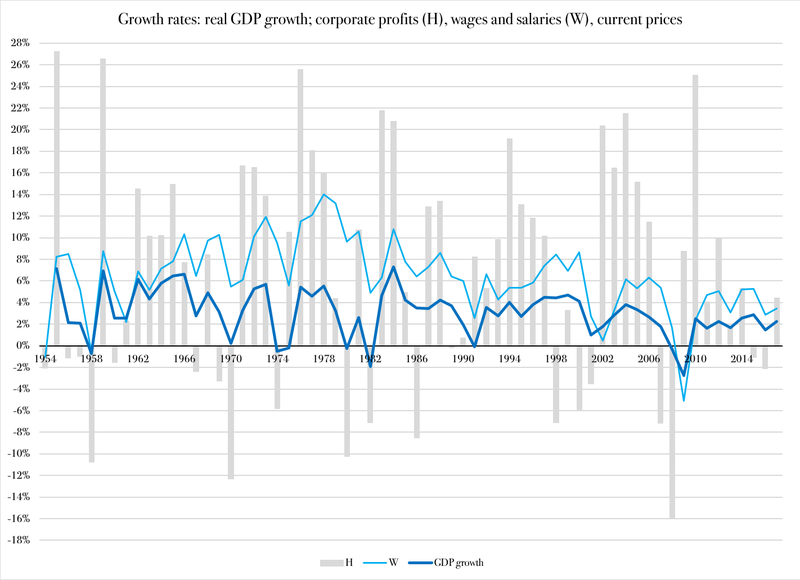 If there were a negative correlation between profits and wages, this would mean that wages would be soaring - which is not the case, as explained in Figure 4. 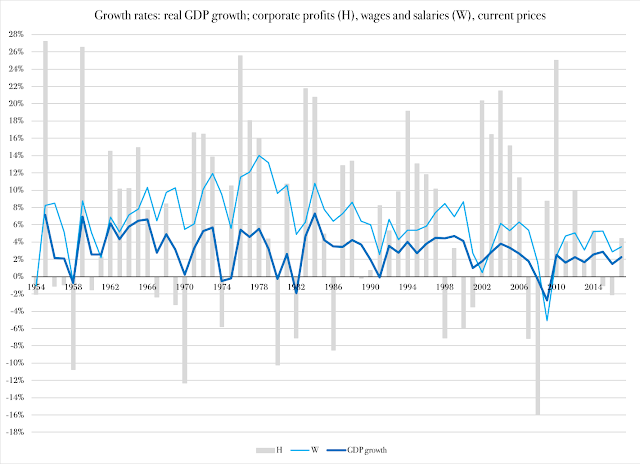 Secondly, wages correlate much more strongly with GDP growth than with profits (positively or negatively). Returning to Figure 3, the ups and downs in wage growth smoothly follow the ups and downs in GDP. * Therefore, slow GDP growth is a more plausible explanation of the decline in the wage-to-profit ratio in Figure 4 than soaring profits. In fact, there is an argument to be made that sluggish growth in profits so far during the 2010s is related to GDP growth as well. This makes sense, as profits depend on the strength of the markets where businesses sell their products; if businesses make less money, or do not see much growth in earnings, it will eventually affect both factors of production: labor as well as capital. All in all, even if we disregard all the theoretical shortcomings of Marxism and its economic conflict theory, the real world clearly disagrees with it. With the growing momentum of socialism within the Democrat party, it will become increasingly important for friends of freedom and prosperity to know what delusions Marx spread around, how they play out in current political rhetoric - and what enormous damage they can do if put to work in actual legislation. *) Growth in wages and profits are displayed in current prices, while GDP growth is reported in inflation-adjusted terms. This is not a perfect combination, but since economic growth is normally discussed in real terms, and the wage v. profit debate is often carried out in current-price terms, the comparison has merit.